It was pitch black outside as my mother led me to the dining room table and had me take a seat in the pre-dawn hours. I was taken by surprise as the pastor of our church and his wife moved from the kitchen to my side at the table. I remember thinking, “It’s awfully early for a prayer meeting…” still unsure why they were gathering at our house before the sun was even up. That was all I heard before my mind started processing the implications. What do I need to do to provide for my family? I was just a young girl but already I knew the implications. My mother was not an American citizen, and within moments of my father’s death, the welfare of our family slipped in and became my concern. I didn’t realize it at the time, in fact I didn’t realize it for another 30 years, but in that split second a spirit of poverty and drivenness entered in and ran my life because I didn’t know truth. I took on a very independent spirit, believing that in my father’s absence, I was responsible for the welfare of our family. The problem was, it was ungodly and unbiblical. God promises to be our provider and our protector. “The helpless put their trust in you. You defend the orphans” (Psalm 10:14). “Even strong young lions sometimes go hungry, but those who trust in the Lord will lack no good thing” (Psalm 34:10). Yet for years God wooed me to trust Him. Trust Him for the little things (like finding misplaced items and good grades) and trust Him for the big things (like a God-honoring spouse and medical check-up results). Just as I delight in providing for my children, God delights in providing for His children. It was never His intent that we would strive and strain, growing weary carrying burdens that He never assigned us to carry. Yet I never fully received the heart revelation of His desire to be my provider until I had the privilege to pray for a friend who lost her husband. She was mourning the loss and wondering how she would make it on her own. As I prayed for her and grieved with her and for her, remembering the days when my own mother lived as a widow while I felt the need to care for her, the Lord showed me that it was His desire all along to be her husband, her provider. “Father of the fatherless and protector of widows is God in his holy habitation” (Psalm 68:5). 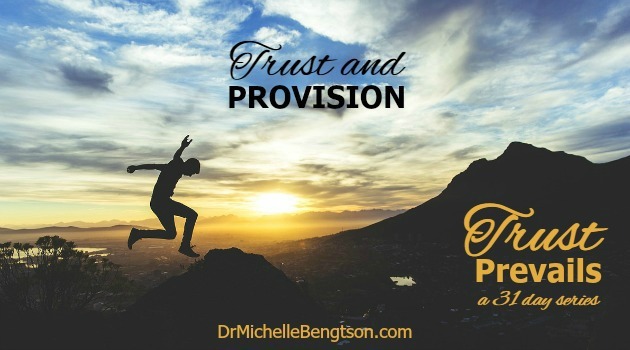 As I began to search out the scriptures, I found that out of the over 220 verses pertaining to trust, over 35 of them in some way related to God’s provision. Yet what I noticed was that the Lord often seems to require that we trust Him FIRST, then His provision follows. “Trust in the Lord and do good. Then you will live safely in the land and prosper” (Psalm 37:3). “Commit everything you do to the Lord. Trust him, and he will help you” (Psalm 37:5). As a young girl, I didn’t know God’s truth, so I was vulnerable to the lies of the enemy. I believed I had to be all, and do all myself. But in His persistent pursuit of me, God’s spirit brought truth and taught me to trust Him to be my provider. He wants to be your provider too. Will you trust Him? Wow, what an incredible insight. And God was willing to pursue you for 30+ years so you could see that. God will continue to pursue us until the day He calls us home.